Citizens Bank Park in Philadelphia before a game between the Chicago Cubs and Philadelphia Phillies last week. With apologies to the ESPYS and the WNBA, Wednesday was what has come to be known as the deadest day on the sporting calendar. 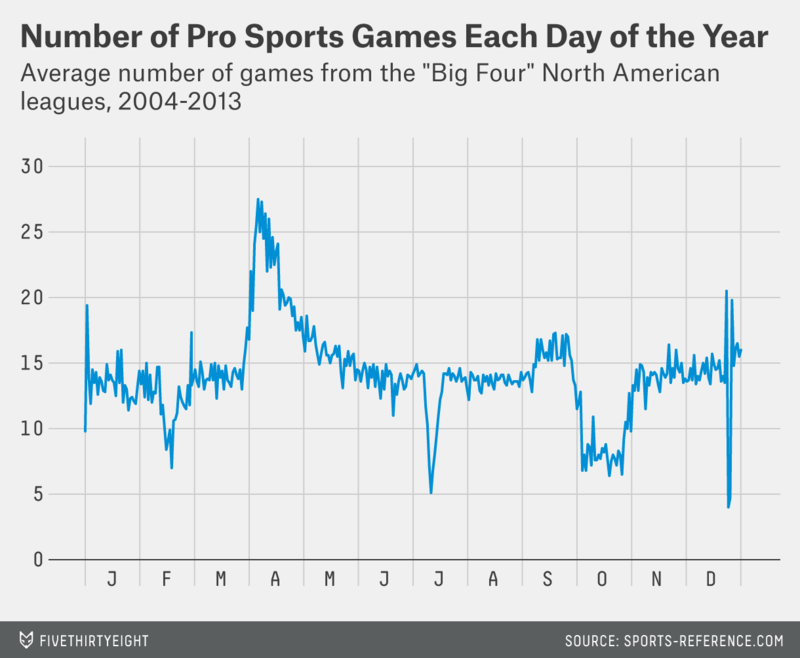 That’s because the day after Major League Baseball’s All-Star Game (which was held Tuesday) traditionally sees no activity whatsoever from North America’s “Big Four” sports leagues (the NFL, the NBA, the NHL and MLB). This barren day doesn’t always occur on the same date, but the All-Star Game has taken place during the week between July 10 and 16 for more than a decade. That noticeable dip in July is what we’re in the midst of, but there’s another time that is, on average, every bit as vacant as ESPYS day: Dec. 24. Christmas Eve is usually an off-day for the NBA and NHL; aside from a stray Friday game in 2004 and Monday Night Football in 2007, the only thing keeping it from complete emptiness is that it fell on a Sunday in 2006 (meaning it had a full compliment of NFL games) and a Saturday in 2005 and 2011 (both years in which the NFL shifted its Week 16 games to Saturday to avoid playing on Christmas Day). Even so, Dec. 24 averaged only four contests per year, lower than any other date over the past 10 years. Christmas itself is always the date of a few notable NBA games, but it has averaged only 4.7 games over the past decade. Combine that with the fact that the MLB All-Star Game is not held on a constant date (July 12 was the most common, seeing an average of 5.1 games), and the holiday season is, statistically, the time in which the fewest games are played per day.